« Are there any crystals that can help with healing my pets? If you were to imagine living in a higher dimensional reality, what would that look like? I envision flowing through a world of beauty, wearing my heart and soul on my sleeve. In this place, we can put our masks and defenses down and be authentic, because we are safe, cherished, and honored by all who are sharing this space. We know we are connected to source and that all of our needs are met perfectly, so there is no need to take from others. We understand the laws of manifestation and creation, so there is no room for worry, envy, sadness, or other lower emotional states created from the concept of lack. We walk in peace and with a sense of inner security. We see each other through the lens of our higher selves, and we recognize the true beauty, glory, and divinity that exists in each of us. How do we pass the time in a realm without drama and strife, without struggling to get our physical and emotional needs met? We play, dance, and celebrate. We connect with our true passions and gifts, and we develop them. We tune our awareness to other levels of reality, we connect with different kingdoms and classes of beings, and we enjoy being with and learn from each other. And perhaps we find a way to join energies and to be of service to lower dimensions where love, enlightenment, and solutions are still desperately needed. Sounds like a faraway dream, perhaps? Yes, we find ourselves living in the 3-D Earth plane, where it is clear that many people are living from a place of fear, limitation, insecurity, and competition for resources. But we know we are here to change the game, to embody more of our higher selves and to develop our soul gifts. We are here to access and to vibrate the higher dimensional energies of peace and love. We are here to remember how to bring the Universal laws into practice here and to show others the way. Blue Kyanite is like a river that flows higher dimensional energy to us, so that we can become calm, clear, and connected to a higher source. And if we can come from this place, we can be effective agents of change for this reality during this time of need. Blue Kyanite is a high vibration, striated stone, which means that it has parallel grooves or recesses down the length of the stone. These striations inherently act as amplifying channels through which higher vibrational energy can be transmitted into the human auric field. Think of Kyanite as a connector, clearer, and activator that can be used in various capacities. When exposed to the human energy field, it naturally aligns and connects the chakras, as well as the various bodies of consciousness (emotional, mental, physical, and spiritual bodies). It can be worked with at any chakra or energy center to open it and to clear lower energies, and also in the meridian system to promote energy flow. So Kyanite can be used as a magic wand to correct energy imbalances, misalignments, or blockages anywhere in the intricate bio-energetic system. It can also be worked with to create a bubble of protective light around you, to seal your aura. This makes it a versatile and invaluable tool for energy healers. Though Blue Kyanite can be used over any chakra, perhaps it shines most brightly when applied to the higher energy centers. Kyanite is regarded as a premier stone for meditation and for reaching higher states of consciousness, and for very good reason. It has a special resonance with the third eye and crown chakras, naturally awakening psychic ability, telepathy, and intuition. And when I was studying at Katrina Raphaell’s Crystal Academy for Advanced Healing Arts, we learned to place Kyanite at the causal chakra, located at the back and center of the top of the head. It is behind the crown chakra, at the place where your hair can create a spiral and where a baby’s “soft spot” is located. This is the area where you to receive higher mental impressions from spiritual sources. I see it as the seat of the evolved mental body, the one that exists beyond the normal mental static we experience and that is attuned to the cosmic mind. You know that this area is activated when you get fleeting visions during meditations that drift away as soon as you notice them, like you experience in the twilight state right before falling asleep. Kyanite has a special capability to activate this chakra, and in doing so it can override frantic mental states that lead to anxiety and keep us locked into 3-D reality. When it is property activated, meditation becomes much easier. Blue Kyanite builds a stronger, more stable, and more vivid connection or pathway to the higher realms. When working regularly with Kyanite, it becomes much easier to consciously receive downloads of information and energy from your higher self and any spirit helpers who work with you. This makes Kyanite a perfect stone for anyone who channels messages and wants to take that ability to a more advanced level. It is like turning up the volume on your radio to spirit so that you can hear and receive more. With all of this incoming information, energy, and light, sometimes an upgrade in our subtle energetic circuitry and nervous system is required to process and integrate it all. Kyanite also assists in that process, creating new pathways and helping to shift engrained thought patterns that aren’t in alignment with higher truth and reality. All of these powerful qualities of Blue Kyanite add up to one beautiful and desirable effect: raising your vibration and moving you into the higher flows of reality. Working consistently with Kyanite can cause your entire bio-energetic matrix to become and to remain clear, balanced, and open. Higher dimensional pathways are awakened and you are able to more clearly access the peace, serenity, and love of the higher realms. This allows you to raise your energy and consciousness above the sometimes chaotic and frenetic energies of the 3-D Earth plane. You can more easily detach and rise above worry, fear, anxiety, anger, and other lower emotional states. When you are able to access these higher states of consciousness, you can view your life from a more expanded perspective. You can bypass the lower emotional and mental responses to any situation you might find yourself in long enough to sense the underlying love and to perceive the higher reason or lesson behind it. You can move into your spiritual mastery and live life more consistently as a walking meditation of peace and higher flow. And when you can maintain this space, the reality around you will inevitably shift. 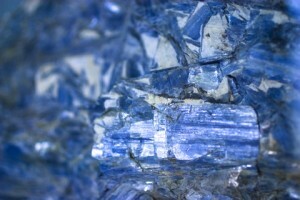 I’d like to share a Kyanite technique to assist you in becoming clear and calm, and in connecting with your higher self. 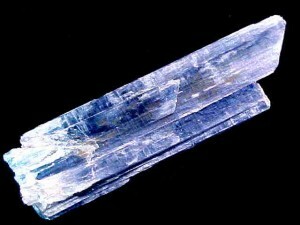 You will need one Blue Kyanite, preferably in natural striated form. Come into a comfortable, reclined position and call in Divine Source, your higher self, and any spirit helpers you like to work with. Begin by closing your eyes and focusing on your breath. Stroke the striations of the Kyanite, and allow it to assist you in becoming more calm and relaxed. Next, hold it lengthwise at your heart chakra, in the center of your chest, so that the striations are in a vertical position. Intend that all of your chakras and subtle bodies are coming into alignment. If you are sensitive, you will probably feel this happening naturally and instantaneously, as if everything is snapping into place. Now visualize a cleansing, light blue column of light entering the top of your head and moving through your entire chakric column. Focus on each chakra, starting at the crown, and send the Kyanite energy there to perfectly cleanse and clear each energy center. You might choose to point the Kyanite at each chakra while you do this, or just mentally send the energy there. When you are done, place the Kyanite above your head, with the striations pointing vertically at your crown chakra. Spend a moment breathing, relaxing, and tuning in to see what you notice. Next, visualize a ladder coming down from the higher dimensions and into your crown chakra. This is your bridge or connection to the soul plane, where your higher self resides. The Kyanite is helping you to build this connective channel. Imagine that a miniature version of yourself is climbing up this ladder now, ascending into the higher dimensions. You find yourself in the soul plane, in front of a beautiful temple. Take in all of the details that you see. You might notice beautiful gardens and nature around the temple. When you are ready, you can step inside of the temple. In the background, you hear the beautiful sound of chanting. There are many high beings here, working in harmony to raise the vibrations of humanity and to align all people with their Higher Selves and purpose. They are sending out a transmission of peace, love, and spiritual activation. You see a glorious light from across the space, and it is approaching you slowly. This is your higher self. As it gets closer, you feel so much unconditional love and peace radiating from your soul to you. And you can see or sense more details about your soul. Spend a few moments tuning in, and trust whatever is coming to you. Now your higher self will share a message with you. Be open to receiving it in any way it comes. It might be a symbol, or words, or a color. Trust whatever comes into your mind. Your higher self is here to answer any questions you might have. Perhaps you have a question about your life purpose or a specific situation you are in. Maybe you are curious about the best next steps to take. Ask whatever is in your heart, and be open to receiving an answer in any way that it comes. When you feel complete, express love and gratitude to your soul in any way that feels right to you. Then imagine that you are climbing back down the ladder and into your body again. In closing, Blue Kyanite is like a stairway to heaven. Kyanite helps to create a pathway, but it is up to us to do the work to climb it and to gather the jewels of the higher realms. And then it’s up to us to bring them back here, to integrate them into our physical lives and to share them. May Blue Kyanite serve you in this way, so that you can serve many others!